I feel most at home in a diner. From the flashy chrome and vinyl decor to the greasy eggs, bacon and burgers, the whole atmosphere makes me feel warm, cozy and relaxed. 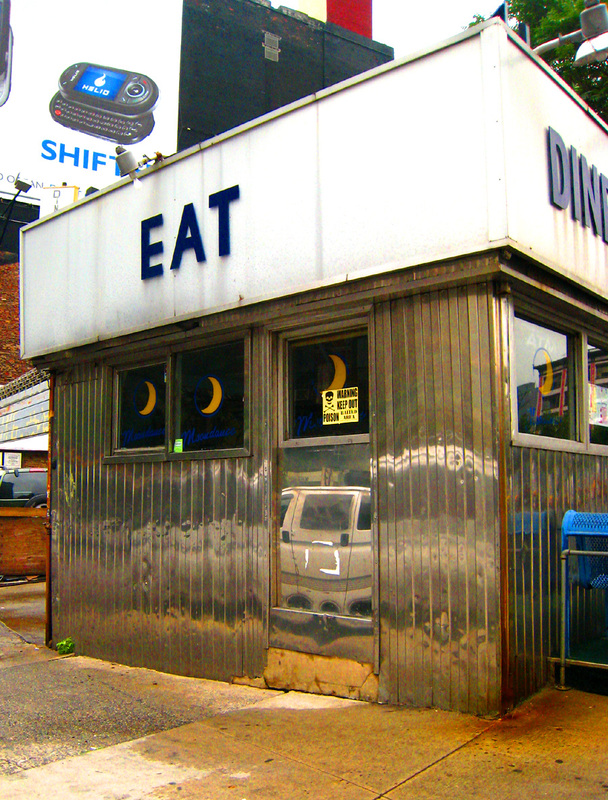 I used to spend nearly every weekend in at least one, but sadly, almost all the classic diners have vanished from NYC. 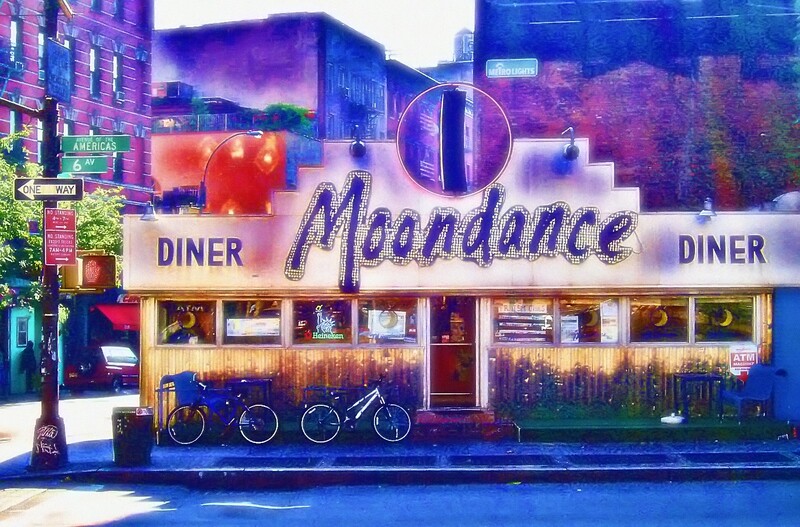 One of the most popular was the Moondance Diner down at the corner of 6th Ave and Grand Streets. 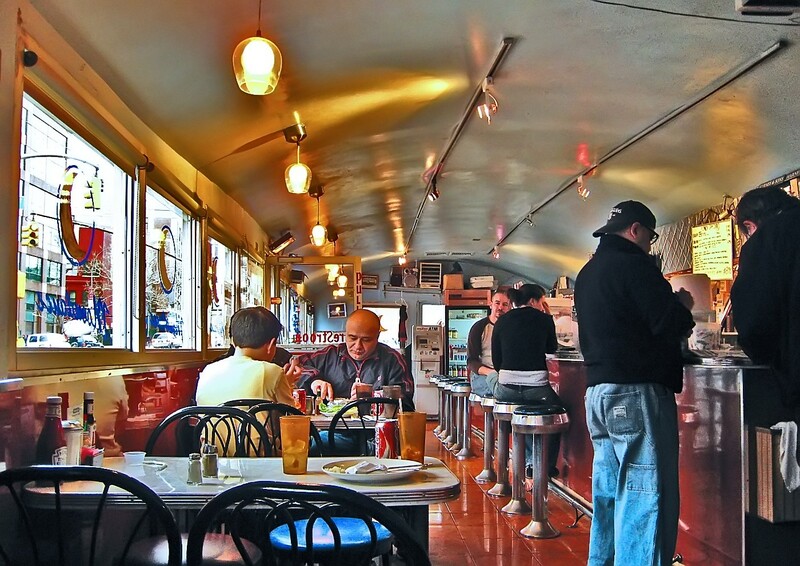 Originally called the Holland Tunnel Diner, it was built in the 1930s and managed to last until 2007 when the coveted corner lot was sold to developers. I loved the traditional travel-trailer steel structure and row of stools along the counter. 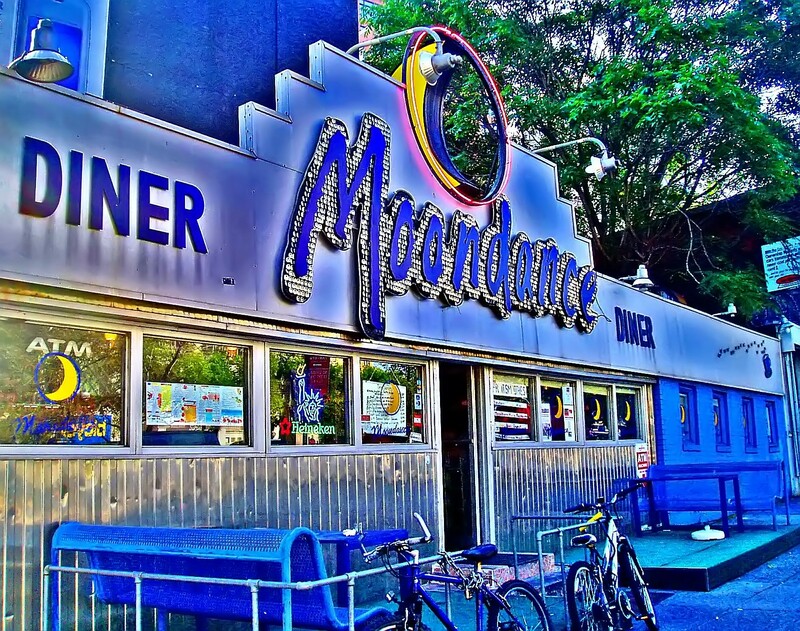 Oddly, the Moondance did not have booths, but regular tables and chairs along the windows. The glittering sign made it famous and the crescent moon, which revolved in the wind, was illuminated at night. Eat! But, note the rat poison sign on the door...this photo was taken after the diner closed. The back side, obviously not as pretty as the front. 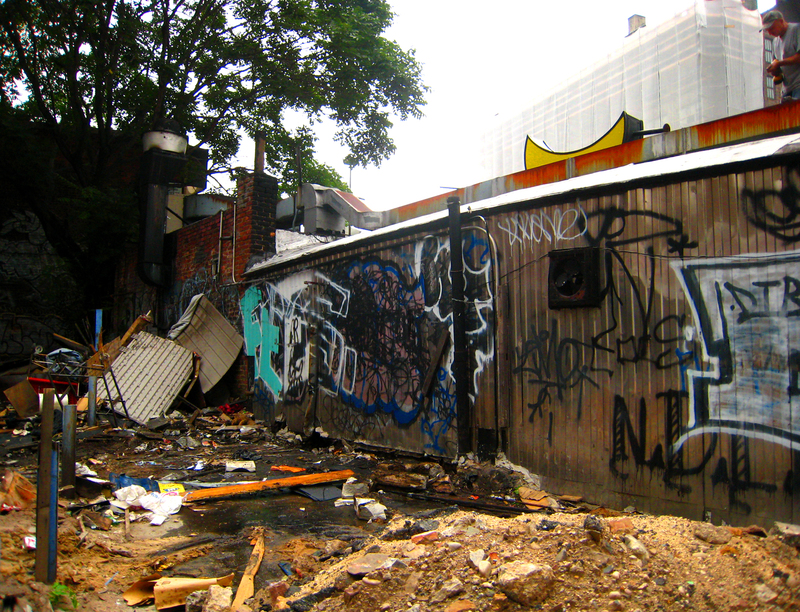 Before it became this messy, I believe this area was used for parking. 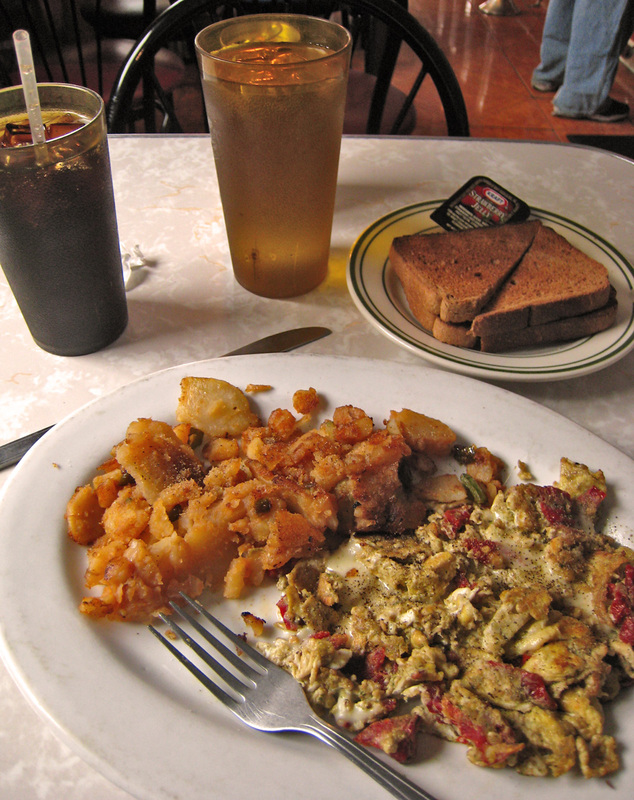 A typical meal for me: omelet, home-fries, wheat toast and a diet Coke. Where's the bacon??! 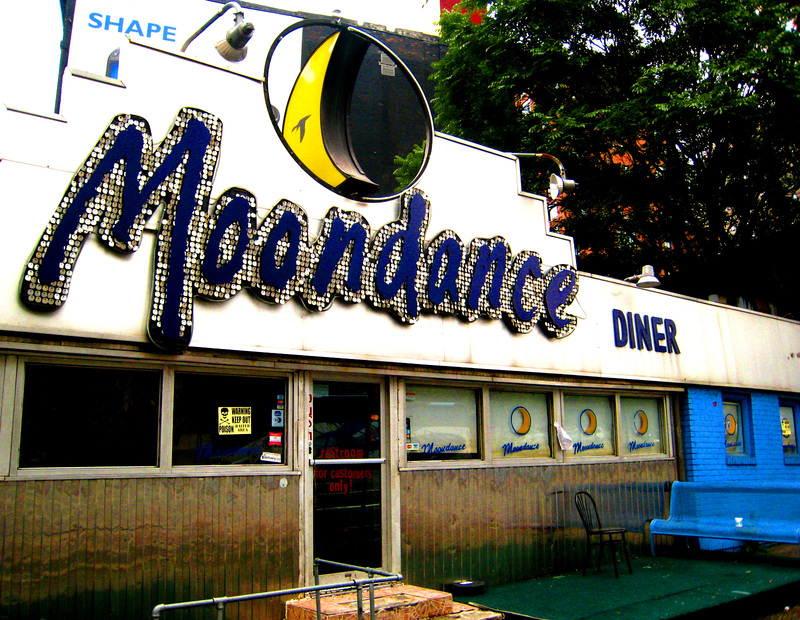 explains his effortst to save, not only the Moondance, but also the Cheyenne (a post on that diner is forthcoming). Thanks to Perlman, the Moondance got a second chance at life, getting packed up on a flatbed truck one night and driven all the way to Wyoming. Still, it was sad to see the iconic sign come down. If you happen to be in or around La Barge, Wyoming, you can visit the Moondance and try out some of their cowboy coffee. 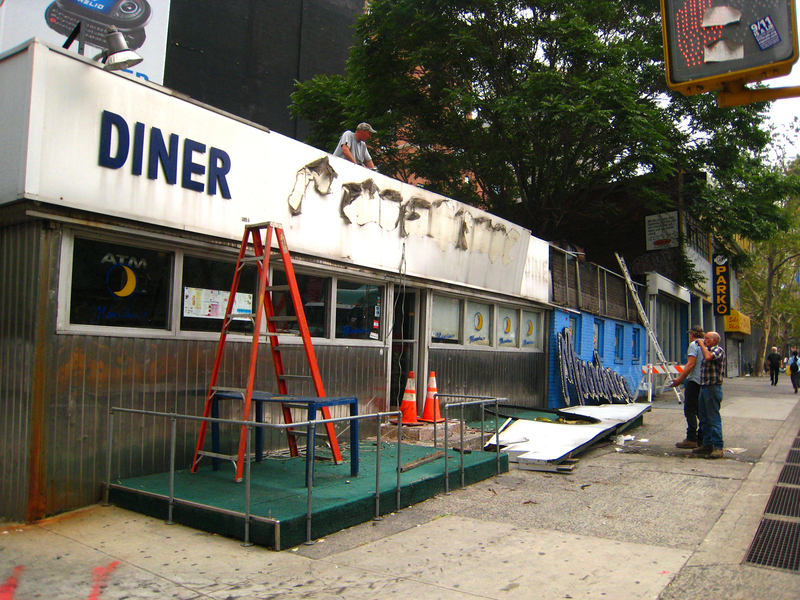 The new owners have also documented the process of moving the diner and seem to take pride in its New York history and cultural significance. For info on several other NYC diners that have disappeared, check out Forgotten New York's classic diner page. Hi Goggla - I thought about the Moondance the other day in some capacity - I can't remember what - probably wondering what happened to it - so thanks for the update. I never made it inside, but I used to walk by all the time, admiring that amazing sign. NY Diners used to have the best burgers you could have anywhere. I mean they were amazing. Another NY tradition lost . . .
Wow. Seems like ages since it closed. Only three years? Made me happy to see these photos. What a treasure. I don't really know what possessed me to post about this now, other than the fact that I walk by this corner nearly every day and the building that has since gone up is so utterly hideous...also, when I get an urge to hole up somewhere comfy with a book and a platter o' bacon, I can't think of many places to go any more. 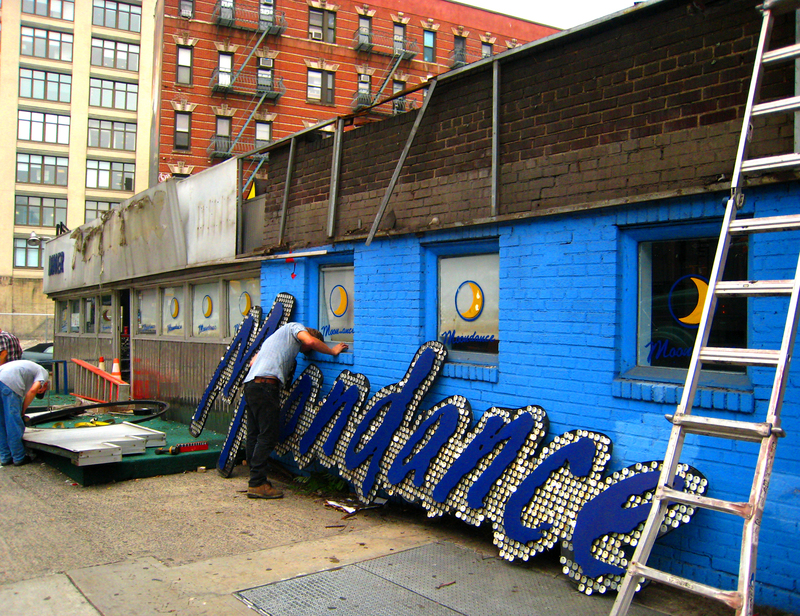 It's a part of our city culture that I really, really loved and am so sad to see disappear in my lifetime. The Square Diner on Varick and Leonard is still around and is worth patronizing. Nice folks in there and the bathrooms remind me of being in an airplane.